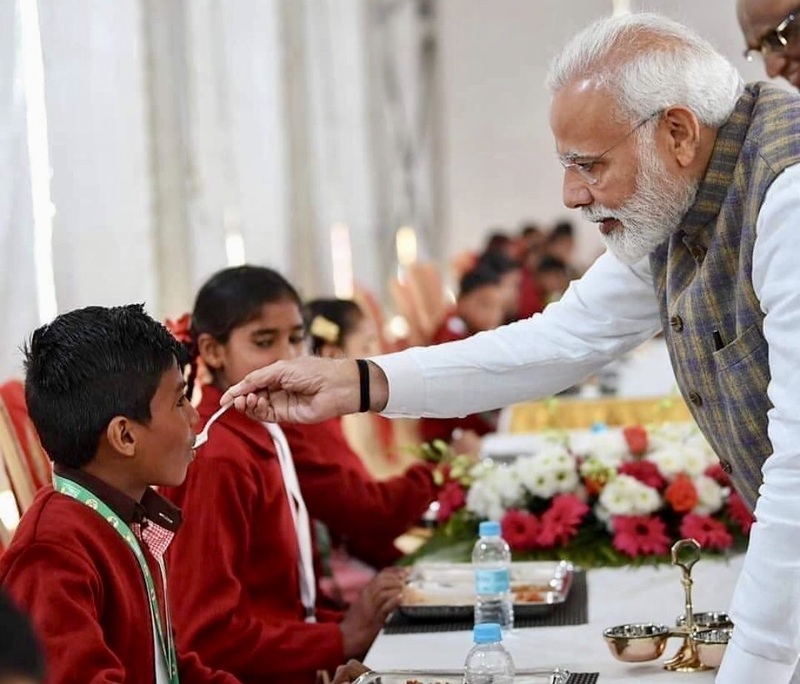 VRINDAVAN, India, February 22, 2019 – Honorable Prime Minister of India, Shri Narendra Modi commemorated The Akshaya Patra Foundation’s serving of cumulative 3 billion meals at an event held at the organization’s campus in Vrindavan, Mathura, on Feb. 11, 2019. The Prime Minister was joined by the Honorable Governor of Uttar Pradesh, Shri Ram Naik, and the Honorable Chief Minister of Uttar Pradesh, Shri Yogi Adityanath. In 2012, Akshaya Patra reached its first major milestone of serving 1 billion cumulative meals since the inception of the program in 2000. By 2016, the organization had already served a cumulative 2 Billion meals. That milestone was commemorated in the presence of Shri Pranab Mukherjee, the then President of India, on Aug. 27, 2016, in Bengaluru. Prime Minister Shri Narendra Modi began the ceremony by paying homage to Srila Prabhupada, the inspiration behind Akshaya Patra’s meal program. Shri Chanchalapathi Dasa welcomed and felicitated the dignitaries. An invocation was sung by Akshaya Patra beneficiaries from Vrindavan. It was followed by speeches by Shri Yogi Adityanath, Shri Mohandas Pai, and Shri Madhu Pandit Dasa. In partnership with the Government of India and various State Governments, and the inestimable support of many philanthropic donors and well-wishers, Akshaya Patra has grown from humble beginnings serving just 1,500 school children across five schools. Today, Akshaya Patra’s Mid-Day Meal Program is the world’s largest (not-for-profit run) school lunch program serving over 1.76 million children from 14,702 schools across 12 states in India.